Business Letterhead Template – Promoting a business can be costly, and is a business all by itself. Many people will overcharge you for simple items that will promote your business when it could be cheaper to make them yourself. And when you are trying to cut costs on your business, or are just starting and want to save money where you can you might leave things out. Rather than miss out on a simple advertising tool such as a good letterhead you can instead use the letterhead template that we have created. This is a multiple colored letterhead format that allows you to place all of your business information such as name, address, phone number and fax line. This helps your business to stand out, giving you a great way to promote it. And with all of your information in the letterhead you can be sure your customers will know how to contact you. You can even personalize it for a specific department or person as well. 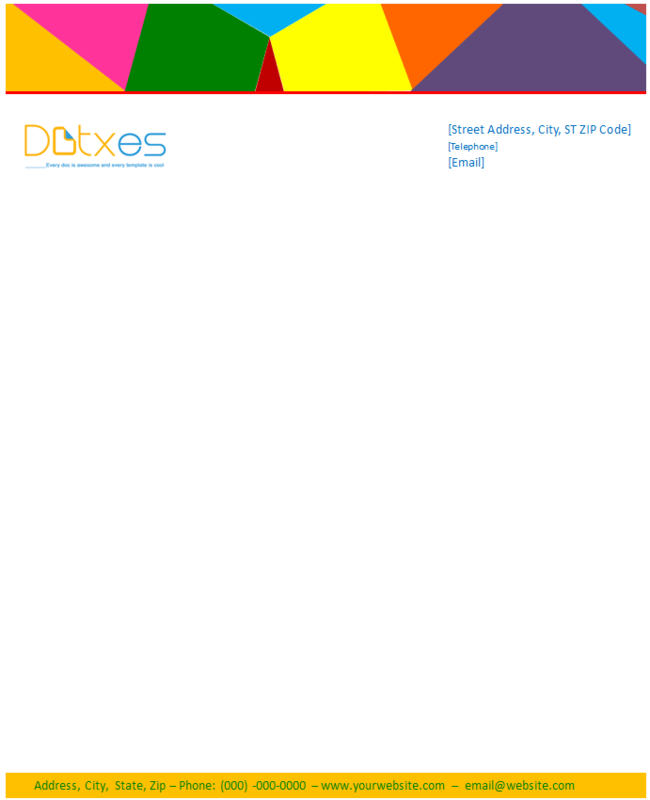 Our letterhead template is easy to download and easy to edit. Make the changes you need to in order for it to fit your business, and then simply save it in your computer. Print a sheet whenever you need it, or have several of them ready for your next letter or invoice. Professional letters shown on a great letterhead bring out the business and identify it. Attract attention to your business with the multiple colored layout. Advertising costs money, yet letterhead accomplishes two things at once, advertising while sending a message. A personal review or reference has more credibility to a new employer when placed on company letterhead. Your customers can identify your letterhead and know the invoice or message is from you the minute they see it. Thank you for making this possible. I’m glad I’ve found a website like this. Once again! Thankyou. The format and the color worked out perfectly. thanks!